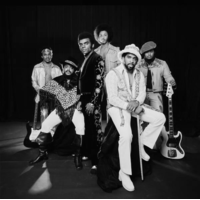 The Isley Brothers (pronounced /ˈaɪzliː/; EYES-lee) are a successful and long-running American music group consisting of different line-ups of six brothers, and a brother-in-law, Chris Jasper. The founding members were O'Kelly Isley, Jr., Rudolph Isley, Ronald Isley and Vernon Isley. Starting their careers in the gospel performing circuit in the early 1950s, they eventually crossed over to secular music first finding modest success in doo-wop until the release of their first million-selling hit, "Shout", in 1959. After several flops resulted in them being dropped from their record label, they found success again with sixties hits such as "Twist & Shout", later covered successfully by The Beatles and the Motown hit, "This Old Heart of Mine (Is Weak for You)" in 1962 and 1966 respectively. The group didn't find success again until the end of the decade when their 1969 single, "It's Your Thing", (with Ernie Isley on bass guitar) was released. The song brought them success in the then-fledgling funk genre. After forming their own label, T-Neck Records, the group found modest success with their own recordings between 1969 and 1972 until revamping the group into a sextet in 1973 with the release of their landmark album, 3 + 3 album, this time featuring younger brothers Ernie Isley and Marvin Isley and brother-in-law Chris Jasper. The addition of Ernie, Marvin, and Chris led to their most successful period as they successfully mixed their brand of R&B with rock, soul and funk elements. Other hits they would have during that period included "Fight the Power" (written by Ernie), "For the Love of You" and "Between the Sheets" (written by Ernie and Marvin). The group disbanded after the departure of Ernie Isley, Marvin Isley and Chris Jasper (who formed Isley/Jasper/Isley and reached #1 on the charts with 'Caravan of Love') in 1984. O'Kelly Isley died two years later. Rudolph and Ronald released the post O'Kelly albums, Smooth Sailin' and Spend the Night in 1987 and 1989 respectively, collaborating with Angela Winbush. Rudolph retired in 1989 leading Ronald to begin a solo career. In 1991, Ronald, Ernie and Marvin began working together again. In 1997, Marvin retired from the group and show business after developing diabetes forcing Ronald and Ernie to continue the group as a duo. The duo scored their final top 40 hit with "Contagious" in 2001. The Isleys were inducted to the Rock & Roll Hall of Fame by Little Richard in 1992 and are the recipient of a single Grammy Award.